Drs. Stuart Sandin and Brian Zgliczynski visited the Center for Insular Research and Observatory of the Environment (CRIOBE) field station in Moorea, French Polynesia to establish a collaboration between the 100 Island Challenge team and scientists at CRIOBE. While strategizing scientific goals and research efforts made by both groups, coral reef surveys were conducted around the island of Moorea. 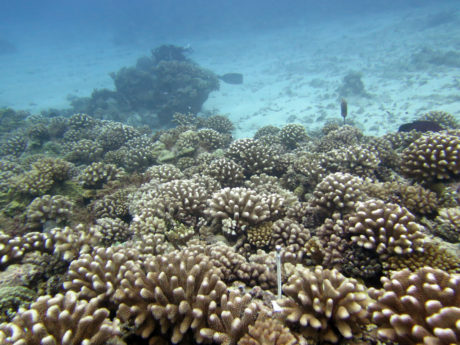 To accomplish the scientific goals of this research expedition, the team employed a collection of standardized approaches to quantify the structure and workings of the benthic community found at Moorea. Generally, survey sites were identified randomly and each site was separated by 1-2 km of linear distance along the reef. Each site was georeferenced and by using standardized methods we are able to contextualize the status of coral reefs of Moorea with reefs through the Pacific as part of the SIO Sandin Lab 100 Island Challenge (100islandchallenge.org). 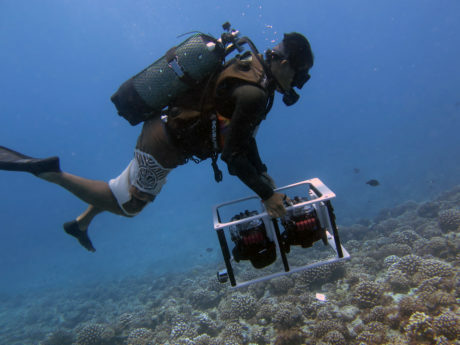 In total, 8 photomosaics were collected at Moorea along the northwestern side of the island.